Ah, the holidays. For many of us it’s a time to be with our families and close friends, take a break from work, and appreciate all the good fortune in our lives. But much as we here at ellie love the holidays (do we ever!) this time of year can also involve plenty of stress, particularly on the parenting front. The holidays are, for many of us, also a time when we travel with our kids—with all of the planning and logistics that involves. We can all probably remember at least one massive mid-flight meltdown or cranky car ride that we’re hoping to avoid in the future. Even the best-laid plans sometimes go awry, so try to go into your trip with a sense of flexibility. You’ve done all you can do to get ready for the trip, but kids are unpredictable. Know that however this trip goes, you’ll come out the other side. Your sense of calm and composure will also benefit your kids. If you are anxious and quick to react, your kids will pick up on it. Talk to your partner or spouse ahead of time to decide who does what. Can you trade off “in charge” shifts? If you have more than one, can you assign primary responsibility for each kid in advance? This should include a change of clothes, any medications, some food and water, a light blanket, and anything else you may need in case plans change. Knowing that you have your “in case of emergency” bag packed can give you peace of mind in case of things like a vehicle breakdown or a missing checked bag. Put everything in your diaper bag in plastic bags so you can easily grab things. For example, make a few plastic bags of changing sets--diapers, wipes, outfit in each so you can grab it instead of rummaging through your bag. Even toys can be in their own bag. Don’t plan your schedule too tightly. Leave extra time to get out of the house so that you don’t start the trip in a rushed or stressed frame of mind. If you can’t avoid a layover on your flight, try to get one that leaves some room for the unexpected. 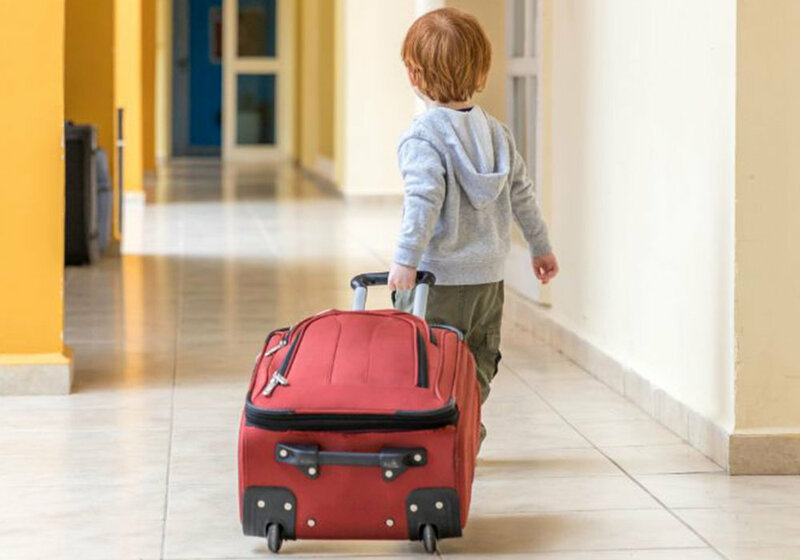 Tight layovers are risky for even the most seasoned traveler, and the travel scheduling variables only increase with kids. Unless you have a sleeping infant or need to secure overhead bin space, don’t be one of the first to board a plane. Toddlers get especially stir crazy on planes. You can shave off an extra 15 minutes of plane time waiting in the terminal for everyone else to board. Give the airline employees at the gate a heads up, then let your kid run up and down the terminal until you really must board. The best trips with babies are the ones when they are able to sleep for most of the journey. With that in mind, try to organize your trips around facilitating sleep when possible. If you’re flying, it’s also helpful to feed your baby when the plane takes off and lands, to ensure that her ears are able to pop and equalize the cabin pressure. Be aware of TSA policies regarding breast milk and formula. You are allowed to travel with more than the standard 3.4 ounces or 100 milliliters, but it’s worth becoming familiar with the screening process and perhaps even printing out guidelines to bring with you. Have a conversation about how to be courteous to others. Let them know that they’ll be sharing space with other people, who may be trying to work or sleep or relax and remind them why it’s important to be respectful. This is particularly important for plane travel, but also applies to being respectful of other family members in the car! Who doesn’t love snacks? It’s perfectly reasonable to strategically relax certain rules during trips, and snacking (or eating meals) during trips can be a great way to keep kids distracted and entertained. Bring a variety, and include some new or favorite “special” treats as well. Similarly, games or shows can help the hours pass quickly for kids of all ages. Don’t worry about screen-time. Allow your child to bring one (or a few, depending on the length of your trip) new or favorite game or show to keep them occupied when they’re not snacking. Specifically for airplanes: headphones and pressure-equalizing earplugs. Headphones for iPad usage can help your child block out his surroundings, which can be particularly useful for kids who may be over-stimulated by the noise and activity of a plane. For kids with sensitivity to pressure changes on flights, earphones can be a godsend—make sure to get the children’s size. GB Pockit Lightweight Stroller This stroller is super lightweight, handy and easy to use. Bebe au Lait Premium Cotton Nursing Cover This nursing cover is lightweight, breathable, but best of all, the top part is structured so you can peer down and easily see your baby and check latch while still having privacy. And since it’s breathable, if your baby falls asleep, you can leave him/ her covered. It also cuts down on stimulation so it’s particularly great for airplanes. Kids Headphones Kids age two and older seem to be willing to wear headphones. If your little one is younger than that, they can still watch an ipad without headphones. Don’t let it stop you. Planes are so loud that the sound doesn’t carry to neighbors! Babyzen YOYO+ Stroller A mom-favorite. Just a heads up, it’s a little pricey, but it’s well worth the money. It’s easy to fold and easy to throw it over a shoulder. It’s particularly good for city people. Magnetic Fun - Cars Planes and Trains The best part of this activity set is it’s magnetic so you won’t lose parts on the plane! BUCKLE TOY "Blossom" Butterfly Backpack – Toddler Early Learning Basic Life Skills Children’s Plush Travel Activity. This toy is great for toddlers. The best things about this pack are 1) your toddler can carry it and 2) you can put stuff IN it!! We hope these tips help make your family’s next holiday trip the best one yet. If you have your own favorite travel tip to share, let us know in the comments or on ellie’s social pages!